I am a right handed bowler that throws a straight ball. Recently I have been missing a lot of single pins (3,5,7,10,etc.). I want to use the 3-6-9 spare shooting system. Where do I stand exactly to get these pins? I discovered my "strike" ball is feet between the middle dot (board #20, or inside of left shoe is on board #22 or 23). When I stand to make my spares do I move right or left from my strike ball spot, or is it from board #20 in line of the headpin? Also, how many boards to left and right do I move? I just watched a video on the Triax Spare system with straight ball and they said for pins on right side of headpin move to left 4 boards at a time, and pins on left side use the 3-6-9 system, move right with 3 boards at a time. Also, is it from where the headpin is located, which is board #20? Incidentally, thank you for all your advice. I just bowled last night using my "strike ball" position and shot a 206!! That's the highest game in league play I ever bowled. All it took was practice, practice and more practice. 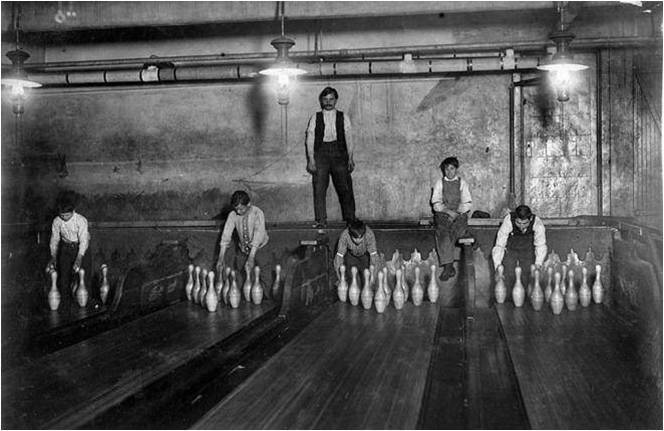 Just picked up a book called Bowling Beyond the Basics. There is a chapter dedicated to spare shooting and they have explanations where the 3-6-9 system fails. It even explains why it fails. Since you're using a straight ball delivery, that's a very good start especially if you're using a plastic ball. I played around with the Triax system several years ago and determined for myself that the 3 or 4 board move Rolf suggested just never worked for me. I finally took a much closer look at the pins themselves and where they were located. Here's what I saw: the head pin sat right on board 20 in the center like you've said. So does the 5-pin, but it's 1 foot behind it. The 8-pin stands behind the 2-pin and the 9-pin behind the 3-pin 1 foot back on the pin deck. The 3-pin stands six boards to the right of the headpin and the 2-pin stands six boards to the left. The 6-pin stands about five boards to the right of the 3-pin and the 4-pin stands about five boards to the left of the 2-pin. The 7-pin and 10-pin are about six boards away from the 4-pin and 6-pin respectively. The book gives places to stand for each of the pins and it gives specific places to begin to roll the ball at the foul line and it provides a chart for both righties and lefties for targeting the 3rd, 4th and 5th arrows. They say that there is an offset of 5 to 6 boards from the inside of your slide foot to where you're rolling your ball from off your shoulder for most all bowlers. I've found that targeting close to the 3rd arrow works pretty well for me; however, there are advantages to use a 4th arrow target so that the lane oil keeps your ball straight by the ball sliding more rather than rolling. If you have a six board offset for where you roll the ball, you should be able to hit the 10-pin by standing on board 25 and target the 3rd arrow (board 15). This places the ball on board 19 at the foul line. The arrows are about 15 feet down the lane and the headpin is 60 feet down the lane. Since you'll target board 15 at 15 feet, your ball will be rolling 4 boards to the right from where it started at the foul line. At 30 feet it will be another 4 boards to the right (board 11). At 45 feet it will be another 4 boards to the right (board 7) and at 60 feet it will roll over board 3. The ball still has another 2 feet to go and it should hit the 10-pin nicely. Linda, some will claim I'm committing bowling heresy, but I suggest you not use the 3-6-9 system. That system assumes too many variables which may/may not exist in different bowlers. Instead I offer up a conceptual approach that can be customized to your delivery. Also, except for a few extreme splits, will allow you to pick up almost all spares with just 6 positions. It will sound like the 3-6-9 but it's not. Here's the concept; Whether you throw the ball straight or hook the ball, where it hits 60 feet away is controlled by where you end up at the foul line. Visualize a teeter-totter laying on it's side. If you move one end to the right the other end will move to the left and vice versus. The teeter-totter can be straight or curved but if you move the end at the foul line right or left, the other end will always move in the opposite direction. If you are shooting on a typical house shot, there will be more oil in the middle of the lane than on the outside. If you use 3-6-9 with a straight ball, many of the angles will fail to pick up spares because the ball will skid down the oil. The solution for all pins is to shoot at an angle across the heavy volume in the middle. This may be accomplished with 3-6-9 but experience says it probably won't. 3-6-9 works best for those who throw a hook. The solution is for you to experiment, keeping in mind where do you need to stand to pick up all the combinations of pins you might leave. For example the same shot that picks up the 3 can also pick up the 3-6, 3-6-10 or 3-6-9-10. The same can be done on the other side with the 2, 2-4, 2-4-7 or 2-4-7-8. In addition these 2 shots will also pick up the 3 pin bucket on both sides. i.e. 2-4-5 or 3-5-6. As you can see, about 80% of all the spares you will leave can be attacked from basically 2 locations. 4 pins and 4-7's along with 6 pins and 6-10's can be attacked from 2 other locations. The only way to know where you need to stand for your ball to pick up all these single pins or combinations is to experiment. Your strike line may or not provide you the necessary angles based on your delivery. The next time you practice, try this. Bring a notebook and pen. Forget throwing to get a strike. Instead, stand anywhere you like and throw a ball that will hit the head pin and continue into the 2, 4 and 7. Move your feet until the other end hits in the correct place. Note which board your left toe was on to accomplish this task. When you can repeat this shot 3 times in a row, make a note. Do the same for the head pin, 3, 6 and 10. Do the same for the 4-7 and 6-10. By the time you master these 4 shots, you'll know if the 3-6-9 system will have accomplished the same thing. You'll also know how to pick up any single pin that makes up any of the combinations mentioned. Where it gets tricky is when you have sleeper pins. Examples would be the 2-8, 2-4-5-8, 3-9, 3-4-5-9 and so on. These spares require you hit on a specific side from a specific angle to be successful. For example, a ball that hits the 3-6-10 will not carry the 3-6-9-10. You will need to select a different angle to carry the sleeper. Only experimenting will show where you need to start. With a straight ball, you will need to angle you ball from the far right corner of the lane to hit between the 3-6 to carry the 9 and 10. I'm suggesting with simply 6 shots or maybe a couple more, you'll learn to make any single pin or multiple pin combination. It'll take you about 5 games to determine and note where you need to stand for these combinations. If you watch the PBA or PWBA they all use this system. They do exactly what you do. They take out a ball that will go straight, stand where they know they will have the correct angle and throw a 'straight' ball to pick up all their spares. They may all shoot strikes in almost the same place, but each will have a different place they use to pick up all the combinations. Four shots will get 80%. Six shots will get an addition 18%. To pick up spares like the 4-7-10 or 6-7-10 will require 2 more shots for a total of 8. But for 98%, 6 shots will get the job done. I don't use the 3-6-9. In fact, I don't even know where I stand on spares. I stand on the approach. Look at the spare pin(s). Mentally draw a line on the lane in the shape of my ball path. From where I am standing, that line goes over an arrow, which becomes my target. For double wood, or sleepers... always target the rear pin. On single pins, go up with confidence. You have over 21 inches in width to hit the pin. 8 1/2" for a ball on either side of a 4+" pin. That's a lot of space. While I know where I stand on spares, I agree with the rest of your comment. Even for people who throw straight at spares, what target line works for one person will not always work for another. That's why 3-6-9 isn't always the best option. A person needs to find out what works for them and then perfect their shot. I use mine because it picks up so many spares with so few lines. LindaDelcamp, you can use the 3-6-9 system IF your making the 3-6-9 adjustments off your corner pin (7 or the 10) . Find your ten pin mark and starting point (feet). When you leave the 6 pin move 3 boards right (feet)and use the same target. If you leave the 3 or the 9 pin move 6 boards right (feet) of your 10 pin starting point,same target. Do the same with the 7 pin only difference is your moving your feet left. The 5 pin you move 1 board right with your feet,same target. spr3wr: Where exactly do you stand for shooting for the 10 pin and 7 pin? If I can figure out where to stand, and move accordingly, I will be able to pick up most of my spares. Right now, I stand for the 10 pin with my feet on board 31 or 32 (feet between the last dot on the left). For the 7 pin, I stand with feet between the last dot on the right. I see that I made a little mistake in my original post. Allow me to correct it. This is about you're using a straight ball delivery method. The head pin sits on board 20 as does the 5-pin, but it's behind the head pin. The 2-pin is on about board 26 and the 3-pin on board 14. The 4-pin is on about board 31 and the 3-pin on board 9. The 7-pin is on about board 37 and 10-pin on board 3. Now let's consider using the 3rd arrow as our target and a six board offset for the laying of the ball compared to where our slide foot is for you as a right-handed bowler. With a six board offset value for rolling the ball, you should be able to hit the 10-pin by standing on board 25 and target the 3rd arrow (board 15). This places the ball on board 19 at the foul line. The angle of your straight ball will begin on board 19 and roll 4 boards to the right at about the 15 foot distance from the foul line for the 10-pin. For the 6-pin make a 2 board move to the right to roll the ball over board 17 and foul line while targeting the 3rd arrow. For the 3-pin or 9-pin make another 2 board move to the right to roll the ball over board 15. For the headpin or 5-pin move 1.5 boards to the right. With a six board offset value for rolling the ball, you should be able to hit the 2-pin or 8-pin by standing on board 17.5 and target the 3rd arrow (board 15). This places the ball on board 11.5 at the foul line. The angle of your straight ball will begin on board 11.5 and roll 3.5 boards to the left at about the 15 foot distance from the foul line for the 2-pin. For the 4-pin make a 2 board move to the right to roll the ball over board 9.5 and foul line while targeting the 3rd arrow. For the 7-pin move over 1.5 boards move to the right to roll the ball over board 8. So stand on board 14 while targeting the 3rd arrow to hit the 7-pin. That's only half the equation. The other part is what is your target? I stand 30 and target to the right of the center arrow. You need to have a target as well, not just move your feet. And, if you do move, move your target 1 board the direction for every 2 boards you move your feet. Hey Dennis, I've played with formulas on spreadsheets for a while as it keeps me entertained. Have used it to try and determine where to stand and where to aim for bowling. What's interesting is that making a 2 and 1 move like you mentioned for at least your first ball seems to keep your breakpoint pretty much the same as you move left for transition. Nice thing to do in most cases I suppose.